Heat 1 inch water to boiling in 2-quart saucepan. Add potatoes. Cover and heat to boiling; reduce heat to medium-low. Cover and cook 6 to 8 minutes or until potatoes are tender; drain. Beat eggs, milk, salt and pepper with fork or wire whisk until a uniform yellow color; set aside. Melt butter in 10-inch skillet over medium-high heat. Cook potatoes in butter 3 to 5 minutes, turning potatoes occasionally, until light brown. Stir in onions. Cook 1 minute, stirring constantly. Pour egg mixture into skillet. As mixture begins to set at bottom and side, gently lift cooked portions with spatula so that thin, uncooked portion can flow to bottom. Avoid constant stirring. Cook 3 to 4 minutes or until eggs are thickened throughout but still moist. Sprinkle with bacon. Cook, crumble and refrigerate the bacon the night before serving, and sprinkle it on the eggs just before serving the next morning. 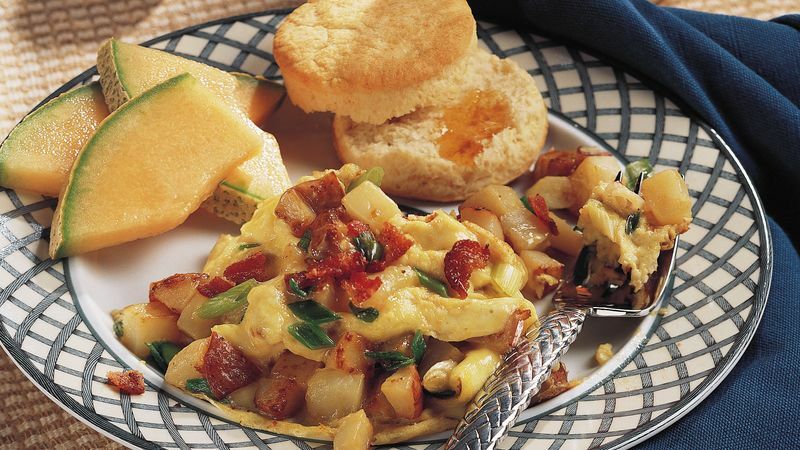 Hot, fresh Bisquick® biscuits and sliced cantaloupe go well with this simple scramble.